UNITED NATIONS, January 8 -- At the UN in New York it is a new era. The old landmark building is being gutted, gifts torn off walls and drilling for asbestos while some people have to continue working in the building. In the new low rise "Wal-Mart" building on the North Lawn, officials ambled Friday on raw concrete floors under the watchful panopticon eyes of security cameras. By Friday night, most of UN Security was in the North Lawn building. Inner City Press was told that contractor Skanska was ordered out, so that the "Secret Service could make a sweep." 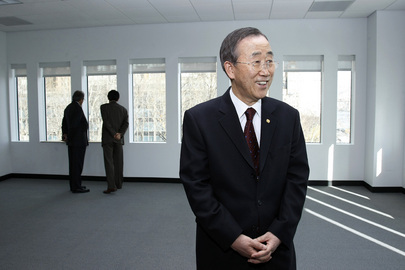 The question was, who would come to Ban Ki-moon's ribbon cutting on Monday? At Friday's noon briefing, the schedule but not invite list for Monday was disclosed. A South Asian correspondent demanded to know why the hedges on the route from the old building to the new are, he said, shaped like a Menorah. Spokesman Martin Nesirky quipped that the cold briefing room had suddenly grown warm. While some called it a newsless day, the UN's dissembling on Sri Lanka, and failure to protect civilians, were fodder for the Press. Up in the UN Staff Union, there was planning against Ban Ki-moon's "fake" celebration of the new building on Monday. The Union questions why Ban has left, as a rat leaves a sinking ship, leaving lower level staff to live for months with asbestos. A letter prepared for distribution at Monday's Town Hall meeting says Ban should have remained, and been a leader by example. With the high ceilinged Delegates Lounge empty -- no bar service, no chairs, just contractor Skanska's blue prints spread out on cheap card tables -- Inner City Press headed Friday at dusk to the relocated Cafe Austria. Before it closed at six, a bottle of beer could be bought for $3.70. High ranking UN officials stopped and chatted, looking warily at the security cameras. By seven p.m. it was dead. A long standing UN official, from the developing world, predicted that this ostensibly temporary building will never be torn down. The UN pays rent to have staff in the Daily News building and elsewhere. If and when the rehab of the landmark is completed, there will be pressure to move those staff to the Lawn. Back in the old building, a cleaning contractor in a blue smock, a 28 year veteran, told Inner City Press that she "cries every night." She pointed at empty walls, where painting had been torn off. An African sculpture, a gift from Nigeria, remained, tall and thin and lonely. Perhaps it could not be returned to Lagos, given the new flight restrictions. UN party people known to Inner City Press asked when and where the Lounge would re-open. In the interim they invited the Press to a Delegates Lounge in exile, out on Lexington. But would it be the same? In the lobby of the landmark, a high placed bureaucrat wept. Her purse had been locked into her office. She was not allowed to return, because Skanska would drill for asbestos over the weekend. She said that Security was all over in the North Lawn buildling. What she didn't know, but the Press later found out, is that Skanska was ordered out of the North Lawn. She asked Inner City Press, why are we still here? Why indeed. Watch this site. UNITED NATIONS, January 8 -- The UN on Friday acknowledged that Secretary General Ban Ki-moon's most recent call for accountability for war crimes in Sri Lanka was more than three months ago. Video here, from Minute 13:19. Since then, former general Sarath Fonseka has accused senior minister and Presidential brother Gotabhaya Rajapaksa of ordering the summary execution of surrendering Tamil Tiger officials, and video footage depicting Sri Lankan Army soldiers shooting blindfolded and naked prisoners has been authenticated by UN Special Rapporteur Philip Alston -- yet Ban has done nothing more. Philip Alston... said that the Secretary-General, he believes, has the power and should appoint such a panel as he has done in the case of Guinea, for example. What’s the Secretary-General’s response? ...Will he do what Mr. Alston is suggesting? Most media took this at face value, and reported that alongside Alston's findings and Fonseka's accusation of war crimes, Ban was somehow raising the pressure or scrutiny on Sri Lanka. This is not true, however. Essentially, in response to a UN Special Rapporteur urging that Ban at least appoint a panel of inquiry into war crimes and the death of tens of thousands of civilians in Sri Lanka, as he unilaterally in response to 157 deaths in Guinea, Ban's spokesman said that Ban has told the government he might do this in Sri Lanka. But after Inner City Press asked when, specifically, Ban had communicated this to the Rajapaksa administration, Nesirky had to belatedly acknowledge that it had been in mid-September. Since then, it seems clear, nothing has been done. Inner City Press asked, how long can consideration be described as active without it resulting in anything? Video here, from Minute 15:04. Nesirky responded that since September, when they received Ban's letter from his political advisor Lynn Pascoe, the Sri Lankan government "will have been considering it." But this has had no, or even negative, results. Following Alston's January 7 authentication of the summary execution footage, Sri Lankan President Mahinda Rajapaksa said conclusorily that his "security personnel haven't been involved in any misconduct," and complained that Alston had "breached UN protocol" by not showing them his report before going public. Since this was described in many news articles as Sri Lanka accusing the UN of violating protocol, Inner City Press asked Nesirky about it in this way. Video here, from Minute 15:41. 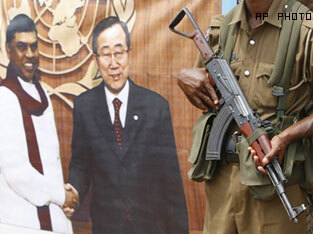 Nesirky pointed out that the Sri Lankans have not complained about Ban Ki-moon at all. And that... says it all. Watch this site. UNITED NATIONS, January 7 -- After the 2009 video depicting Sri Lankan soldiers shooting blindfolded prisoners was deemed credible in a detailed report Thursday by UN Special Rapporteur Philip Alston, Inner City Press asked the spokesman for UN Secretary General Ban Ki-moon if Mr. Ban would move to appoint a panel of inquiry, as he did to investigate the 157 people killed in Guinea on September 28, 2009. Video here, from Minute 45:21. Mr. Ban's spokeman Martin Nesirky began by saying that since UN High Commissioner for Human Rights Navi Pillay had already called for an investigation of war crimes in Sri Lanka, there was no need for a similar call by Ban Ki-moon, "no need for a second track." But when Inner City Press asked Nesirky to explain why Ban has been delegating Sri Lanka to Geneva, where given the make up of the Human Rights Council a resolution calling for an investigation like Richard Goldstone's of Gaza failed, Nesirky included in his response something it seems he should have stated from outset. "The Secretary General has informed the government of Sri Lanka that he is considering appoint a commission of experts to advise him further and to assist the government in taking measures" on violations of human rights, Nesirky said. Video here, from Minute 48:20. Inner City Press asked Nesirky WHEN Mr. Ban had conveyed this to the government of Sri Lanka, since Ban had made no mention of it in his response to Inner City Press' question to him the prior day on accountability and Sri Lanka. "I don't know," Nesirky said, committing to return with the information. Watch this site. Some are dubious of the UN's follow through on its call for accountabilty and an inclusive political process in Sri Lanka, given most recently the UN's rejection of playing any role in ensuring fairness in the January 26 elections. The reason Nesirky gave on July 6, a week after Inner City Press asked for the UN's response, was that it would require a General Assembly resolution and there wasn't time. But when Inner City Press asked General Assembly spokesman Jean Victor Nkolo at the Janury 7 noon briefing if the GA could have met in less then three weeks, he didn't not say no. Watch this site. UNITED NATIONS, January 6 -- On the day the UN belatedly confirmed it would not be providing any observers to attempt to reduce fraud and disenfranchisement in Sri Lanka's January 26 elections, Inner City Press asked Secretary General Ban Ki-moon about the internally displaced people who remain in the camps the government moved and locked them into, and about accountability for war crimes. Video here, from Minute 9:50. Ban Ki-moon answered only the first to the two questions, citing Sri Lanka's commitment to empty the camps by the end of January -- that is, after the elections. According to aid groups, over 90,000 people, nearly entirely Tamils, remain in the camps. Fewer than 10% of them are registered to be able to vote. Inner City Press: I wanted to ask you, if I can, on Sri Lanka. Right now the IDP [internally displaced persons] camps, there are still people inside them. There has also been a failure to do any investigation of the events of May, and most recently, it seems like you have decided not to send electoral assistance to the country. Can you say how the first of those are consistent with the commitments made to the UN, and your commitment to stay on top of this issue? Ban Ki-moon: On Sri Lanka, their promise, President [Mahinda] Rajapaksa's promise is that by the end of January this year, his Government will have all the remaining displaced persons in the camp resettled, reintegrated into their native homes or some other place. 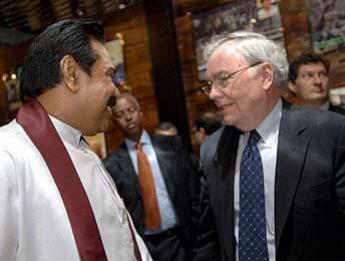 I am going to discuss this matter with the Sri Lankan Government. I hope that they will keep their promise. What about accountability? The Special Raporteur on Summary Executions Philip Alston gives a press conference at the UN on January 7. Watch this space.